An eastern cicada killer (Sphecius speciosus) searches for her burrow | Jacksonville, Illinois. I don’t normally spend much time trying to photograph insects in flight. To really do it right requires some rather specialized equipment, including very high-speed flash, and a bucketload of patience and skill. John Abbott exemplifies those whose great talent has produced stunning photographs of insects in mid-flight. That’s not to say that it can’t be done “on the fly,” so to speak, and even a hack like me can get lucky every now and then. Earlier today I found a rather large number of eastern cicada killers (Sphecius speciosus) in a ball field in Jacksonville, Illinois. These impressive wasps are the largest wasp in eastern North America and have the rather gruesome habit of paralyzing cicadas with their sting, and then dragging them down into their burrows to be eaten alive by their grubs. I’ve recently become interested in solitary wasps (for reasons to be discussed later) and decided to see if I could get some decent photographs. I got a few I like (more on this later), but my favorite is this total luck-out shot of a wasp face-on in mid-flight. As I watched them, I noticed that each wasp spent a fair amount of time trying to identify its burrow amongst the dozen or more that were clustered along one side of the field. Occasionally they would land and search about a bit on foot, then take wing again to continue their search. I decided the best way to get a shot of one on the wing would be to watch for a wasp to arrive and begin its search. When I spotted one I would slowly close distance so I could be ready to get down on my elbows as soon as it landed (closing distance without spooking the wasp was not easy). I had just my center focal point set and autofocus turned on (normally I don’t use autofocus) and had already worked out a good flash exposure compensation setting. As soon as I got on my elbows, I would quickly frame the wasp and repeatedly trigger the autofocus as I got even closer, and when the wasp took flight I took the shot. This was still a crap shoot—I ended up with lots of out-of-focus and out-of-frame photos. Nevertheless, a few turned out fairly decent, one of which was this single, perfectly head-on and well-focused photo (though admittedly somewhat cropped). Too bad I didn’t collect any of the wasps—at $49 each I could’ve made enough cash to buy that flash bracket I’ve been eyeing! This entry was posted in Crabronidae, Hymenoptera and tagged entomology, Illinois, insects, nature, photography, science, techniques, wasps. Bookmark the permalink. very good I love see more things from you. 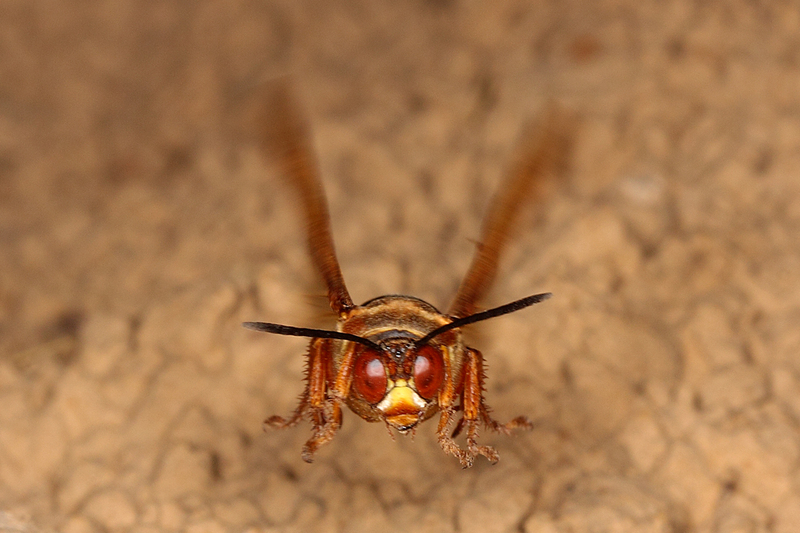 I realize that insects cannot change their facial expression to express emotion but this one looks irate. What a great picture. I like the concept of auto-focus, but mine seems completely unable to read my mind. And then there is the shutter-lag shadow that falls between the motion and the act: most of my flight pictures end not with a bang, but a wimper. Not a chance I would even try if I had those obstacles to deal with.